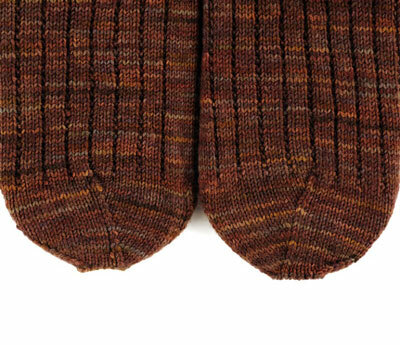 Knit these garter rib socks from the top down, using a variation of 3 x 1 ribbing. 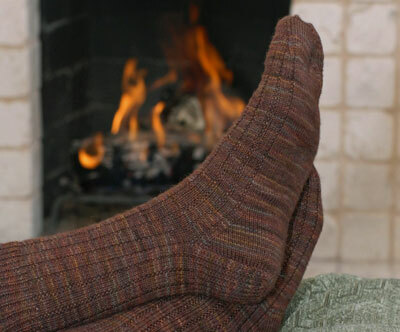 The slip-stitch heel pattern is carried through the heel turn and the toe is shaped in a swirl pattern. 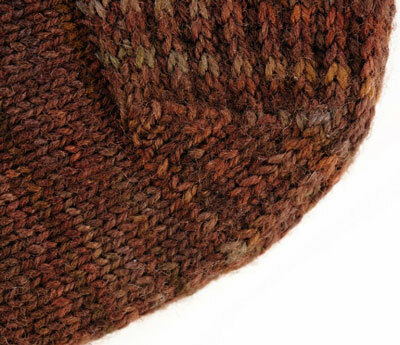 This stitch pattern works with any cast-on number that is a multiple of 4. You can work this sock over any multiple of 4 sts. Length is adjustable. Rep this round for patt. Round 1: * K3, p1 *, rep from * to * around. Rep these 2 rounds for patt. Start with the cuff and leg. CO 72 (76, 80, 88) sts. Divide evenly over four dpns and join for working in the round. Place a marker to indicate beg of the round. Work in 1 x 1 Rib for 1.5 inches. Switch to 3 x 1 Garter Rib patt and continue even until leg measures 7 (7.5, 8, 8.5) inches from beg or desired length, ending with a round 1. Work the heel over 36 (38, 40, 44) sts. Row 1 (RS): * Sl 1 pwise wyib, k1 *, rep from * to * for 36 (38, 40, 44) sts. Turn. Row 2 (WS): Sl 1 pwise wyif, purl across heel sts. Repeat rows 1 and 2 until you have worked 36 (38, 40, 44) rows. Row 1 (RS): * Sl 1 pwise wyib, k1 *, rep from * to * across 20 (21, 22, 24) sts, ssk, k1, turn. Row 2 (WS): Sl 1, p5, p2tog, p1, turn. Row 3: Work in established slip-st patt to 1 before gap, ssk, k1, turn. Row 4: Sl 1, purl to 1 before gap, p2tog, p1, turn. Rep rows 3 and 4 until you have worked all heel sts, ending with ssk and p2tog if you don’t have enough sts to end with k1. 20 (22, 22, 24) sts rem. Next Round: K 20 (22, 22, 24) sts. With the same needle, pick up and knit 18 (19, 20, 22) sts along side of heel flap plus 1 st in the corner at the top of the flap. 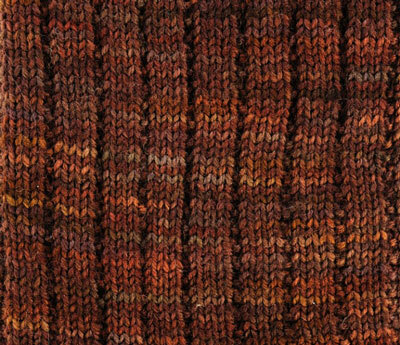 Knit across 36 (38, 40, 44) sts of instep (round 2 of Garter Rib patt as established). With an empty needle, pick up 1 st in the corner at the top of the heel flap, then pick up 18 (19, 20, 22) sts along side of heel flap. With same needle, knit 10 (11, 11, 12) sts from bottom of heel. Round now begins from center back heel. Work the decrease for the gusset. Needle 1: K to last 3 sts of needle, k2tog, k1. 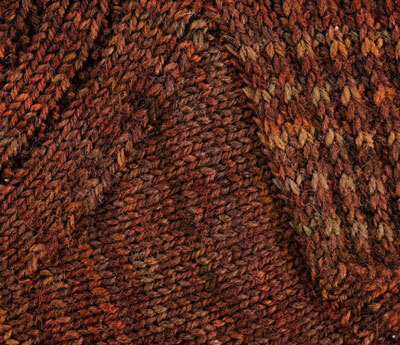 Needles 2 and 3: Work in Garter Rib patt over 36 (38, 40, 44) instep sts as established. Needle 4: K1, ssk, k to end of needle. Repeat rounds 1 and 2 until 72 (76, 80, 88) sts rem. 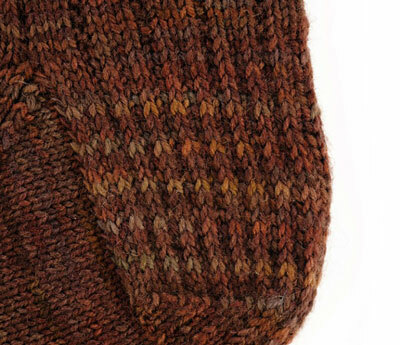 Continue even, maintaining Garter Rib patt for instep and St st for sole, until foot measures 8 (8, 8.5, 9) inches from back of heel, or 2 (2.25, 2.25, 2.5) inches less than desired total foot length. Round 1: * K1, ssk, k to end of needle *, rep from * to * for each needle. Repeat rounds 1 and 2 until 36 (40, 40, 44) sts rem. Repeat Round 1 only until 16 (16, 16, 16) sts rem. Round 1: * K to last 3 sts on needle, k2tog, k1 *, rep from * to * for each needle. Graft toe using Kitchener st.